Danny argues that Google is unfairly dominating the Firefox toolbar. I think he’s right. Microsoft is not even among the choices, and Google is the default. Google, of course, represents the majority of Mozilla’s revenues (Mozilla is the company behind Firefox). Danny’s most interesting point is how hard Google fought to keep Microsoft from making Live search the default in Internet Explorer. But Google’s actions with Firefox are making it increasingly likely Microsoft will act to change that stance. That’s what I meant when I said Microsoft is “lying in the weeds” a few months ago. It may be that the situations seem parallel, but Microsoft is an adjudged monopolist. When you have dominance in a market (in the Microsoft example, the OS market), trying to leverage that to attain an advantage elsewhere (web search) is problematic. In the Firefox example, we’re talking about a browser with less than 20% share choosing who to partner with. So from a purely legal perspective, the two situations are not the same. That said, from a consumer choice perspective, the answer may be different. Even if MS does act to change that in say IE8, there’s no way they can be too aggressive because of the anti-trust history. Besides, do your really think the browser search bar defaults make a big difference to searching habits? If MS went all out and changed IE to only allow Live searches, it still would only give them a few points more market share. My sense is that most users will still just type in google and not use the search bar for all their searching. Does anyone have numbers on searches from the homepage vs the search bar? He also mentions that it might be a good idea to include the rest of the 23 options to the upper browser window, which would create this preposterously long list that would be cluttered and ugly. If you really want to use Live search, it’s relatively simple to add it in. What I really want is an option that randomly selects one of the search engines, for each new query that I do. That way I can continually get a sense of how well each engine is doing, rather than fall into a lazy slump of just relying on a single engine. Does anyone know if there is some sort of plugin, for that upper right search box area, that does this? to the first guest, your legal perspective may hold if google is not paying money to firefox. otherwise what’s the difference between this situation and the one microsoft is accused of, i.e., giving money or discount to a computer maker to choose windows exclusively. in that case a computer maker may have like 20% market share and it was choosing windows exclusively albeit for money. same as firefox does. note that google does have dominating search share in many markets. How about we add all 14,875 search services available at http://mycroft.mozdev.org to the drop-down list. That would be super useful!!! Right not Firefox offers the number 1 and number 2 “general” search services, a general ecommerce service, wikipedia, and a general auction search for most Firefox locales. Where we’re not offering the most popular search engines (yandex in russia, baidu in china, naver in korea, etc., etc.) we’re working with our locale communities to update. Demanding we add a third general search that’s much less popular — especially outside of the US, is silly. If you really want Microsoft’s search, it’s a couple of clicks away — just like thousands of other less popular services. +1 to the monopoly argument above, even given that Google is paying them for the privilege. I don’t understand the parallel that Danny is drawing – Mozilla is supposed to compete on gentlemen’s terms, as an underdog, even when Microsoft has long shown they don’t play nice themselves? In a way, the fact that Google is paying for the privilege makes it even easier to justify. If Microsoft wants to be there, they can pay for the privilege, too. Why wouldn’t they, after all? Oh, yeah – because they’re using their inferior product with 80% share to prop up another inferior product with 4% share. What Danny is asking is not just for Firefox to give equal time to a worthy competitor to Google’s search – Danny’s asking for Firefox to help promote the four-to-one markey leader in Firefox’s own product category! Cthulhu’s tentacles, it’s tough to compete as an open-source business. Google’s money is what funds Firefox development, by and large. Should Mozilla cut off their left leg before the race? Or their right? When they’re already coming from behind and the guy in front of them is driving a car? I think people greatly underestimate how critical a role Firefox has played in Google’s search triumph (and Yahoo’s subsequent fall from grace) as well as in destabilizing Microsoft. It is also ironic that Blake Ross who was influential in the Firefox ascendancy is now just a worker bee under the shadow of a greatly overhyped Facebook. At some point, Microsoft will need to consider one giant omnipresent search box in the middle of the desktop. Do you also think Microsoft should give Windows users a choice to choose Firefox as their browser instead of IE? If you’re not insisting Microsoft give people default access to Firefox, why insist Firefox give people default access to a company that is trying to kill them? Narendra, isn’t there a fairly low upper bound on the amount of influence something that has only recently achieved 20% share could have had on the adoption of a service that has long been over a 50% share? Google gets huge usage from people who have never heard of Firefox – and outside the Web 2.0 village, there are a lot of people who have never heard of Firefox. Mark just said what I was trying to say, but in fewer words. Has everyone forgotten what Microsoft is like? If we’re trying to give a boost to a marginal search engine, why aren’t we trying to boost Ask instead? Asa, Joe smith and others sarcastic people who suggest that Mozilla should add all providers to the list are just being plain stupid. It makes sense for mozilla to add top 3 search providers to the list and by not doing it they are being coy. Google has blatently bought its market share by paying people like mozilla and dell. If they do so they should at least not tout net neutrality and openness horns. If we’re trying to give a boost to a marginal search engine, why aren’t we trying to boost Ask instead? Imagine this: What if there were a Firefox plugin, that every time that you type in a query, it fires off that query to four different search engines: G, Y, M and Ask. And to any other engine that you want to add to that list. Then, when you click or otherwise indicate the relevance of that result, the Firefox plugin keeps track of *where* in the G, Y, M, and Ask SERP list that result appeared. I.e. it should track of whether that result appeared 3rd in the G list, 2nd in the Y list, 5th in the Ask list, etc. Then, over time, the more you search, the more you can get *direct feedback* as to which engine is the best for you. It could be, that for the way you use the web, a search engine that you didn’t think was very good actually works for you much better than you thought it would. But right now, you will not try that engine, because of emotions. You probably tried it once, searching for your own name, didn’t like what you saw, and then concluded that anything and everything that engine does was crap. Too often, people use just one search engine, and stick with that one, because they have irrational emotional or political attachments to it. But this is a new era of computer science, one in which, because of these networked tools, we can directly measure how well something actually works, without attaching any human emotion or bias to it. So what I want to see Firefox do is build this sort of tool into their platform. Think of it as the “power to the people” analog to Google AdWords. Google will rank an advertisement higher, the more clicks it gets, the more relevant it appears to be, based on users actions. We should be able to take advantage of similar tools, and track *our own* search activity, and see which search engine meet our own information needs the best, most of the time. Firefox should not favor Google. They should also not favor Microsoft. Firefox should favor the user. And favor relevance. Because at the end of the day, it is all about relevance. And a company like Google, no matter how much money they are paying, would have to agree. They say it all the time, about how it’s all about user relevance. And so a Firefox plugin that directly an on-goingly measured that relevance across multiple search engines would be something that, in the end, would benefit the user most of all. This is not like the old days, of Wordprocessor or spreadsheet battles. This is a new day, where we can directly measure the target application: Relevance of search results. The Firefox browser should directly aid in that measurement, and serve the user by making the user conscious of exactly how well and how often various search engines perform on that user’s queries. Simon: Google has bought its 60-80% (global) market share via firefox (16%) and Dell (16%)? Why top 3 and not top 2 or top 4 or top 5 or top 10? Because it results in the choice you personally would most prefer? What about for locales where Microsoft’s search isn’t in the top 3 or even in the top 4 or top 5? Why top 3 and not top 2 or top 4 or top 5 or top 10? Because it results in the choice you personally would most prefer? What about for locales where Microsoft’s search isn’t in the top 3 or even in the top 4 or top 5? That’s why the best solution would be for the browser to support behavior that sends your query out to *every* search engine, not just some arbitrary small number, and then reported back to you the longer term statistics about how well each engine *would* have done on your query, had you chosen that engine. Turn the problem around on its head. Truly give users a choice, by letting them continually run “what if” scenarios on all engines, and measure it. This is the domain of the browser. No one search engine is ever going to implement this, no one search engine is ever going to help the user in this manner. The browser has the capability to do this. But only if it’s not in the pocket of some search engine. Big web companies have the power to A/B test their users, automatically. Tweak small changes, and see how it affects user clickthroughs. Web browsers should give us, the users, power to do the same thing, in reverse. They should give us the power to A/B test different search engines. And one way of doing it, as I’ve said above, is to build into the browser the capability of sending your query to multiple engines, and then have the browser track/aggregate/plot/analyze your history of interactions, and *tell* you which search engine would be better for you, search engine A or search engine B, based on the type of queries that you do. And give you the actual statistics to back that recommendation up. There used to be this sense about 10 years ago, like in the Wired magazine of 1997, of technology’s ability to returning the power back to the people. I feel like we’ve really lost that, in Web 2.0. All the power is flowing to the large aggregators, the centralized data miners. We end users should be able to do some data mining ourselves, via for example this automated search engine A/B testing. And the browser should be supporting us, in that quest! I really feel strongly about this topic. And that’s why it kills me when I read comments (both in this blog and on Danny Sullivan’s blog) from people whose reaction is “well, Microsoft is a convicted monopolist, so good for Google for doing it too!” That so misses the point. This issue, about the browser, is not about Microsoft, nor is it about Google. It is about the user, and empowering the user in their own web experience. Information is key to that power, a point that was often the topic of Wired articles back in 1997.. and a point that I think gets lost today. Users, IMHO, need to know as much about the various search engines and how well they perform, using real statistics and real patterns of one’s own usage, as the search engines themselves know about their users. In response to the various “Microsoft is a convicted monopolist arguments,” well, I don’t care. Google didn’t argue that there should be choice in IE7 because of Microsoft’s past record. Google has argued that consumers deserved to have a choice, period. And if they deserve to have a choice, then they deserve that in any browser, period. If Google’s for choice, then get behind choice — and fight against people buying the default in IE, Firefox, on Dell computer, on HP computer, etc. @Mark IE7 does make users chose. That’s why I’m not demanding it. You have to chose because Google caused enough pressure on Microsoft for that to be the behavior. I’m demanding that Google simply do in Firefox what it demanded be the case in IE. @Skott I’d like to see Ask included as well. For the US market, Google, Yahoo, Microsoft and Ask are all excellent search choices. Forget marketshare — all of them are good choices I’d expect Firefox to include. @Joe Smith, please go to http://groowe.com and download that toolbar. There are over 20 search engine in it, nicely organized, not in an overwhelming manner, and it’s the first thing I install on any new browser, because it is so well done. Firefox, as a leading browser, could do the same. It could show this degree of care to its search box from the outset. JG, in the old days (Mozilla’s browser before Firefox) we offered aggregated search results across all or a designated sub-set of your installed search services. It was a cumbersome experience and didn’t really take off. I know it sounds good in theory, but it doesn’t really work out very well in practice. I suggest you download Mozilla 1.0 or one of those older releases and play around with it. This situation can be fixed rather easily, but it’s not going to be good for Mozilla’s for-profit subsidiary that collects money from Google. Here’s what needs to happen: during the installation phase, ask the user which search engine they would like to make the default. Done! Easy. It seems rather obvious that this is not going to change unless the involved parties are forced to change. Google makes money from the traffic that Mozilla sends it. Mozilla gets to pay its developers with the money from Google. This is a win-win as far as they are concerned. And personally, I don’t want anything other than Google as my default, so I like it that way. I also like that Google is helping fund the development of my favorite browser. And if that little bit on the left was the aggregation that you did, well, that’s not really what I am talking about. It seems to be all Google, anyway. 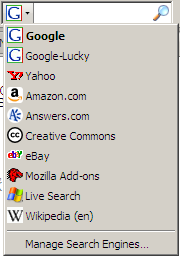 Imagine a scenario where you still get to choose your favorite browser (hopefully with Ask and Live and etc. as part of the default choices). And you still only see the results from that one engine. You don’t see an aggregation of multiple results from multiple engines. So Firefox then keeps track of that statistic. It notes that, had you used Yahoo, you would have found your result one quicker. Had you used Live, you would have found it in the same amount of time, had you used Infoseek you would have never found it, etc. Then, it stores that information. Periodically.. say every day or every week.. or even every 50 queries that you do, it pops up a statistics window, and shows you what your average rank *would have been*, had you used a different search engine, instead. It would give you information on average “what if” ranks, on standard deviations, etc. Lots of info, like you get with Google Analytics. But Google Analytics that serves you, the user, rather than serves the advertiser. In that manner, you can continue with your engine of choice, and not be forced to mix and match, aggregate results. At the same time, you can become constantly aware of your opportunity cost by continuing to stick with that engine of choice. It may very well be that your engine is the best engine, for the queries that you do. But it may also well be that you become aware of a different engine, with better performance. And you can gain that awareness without having to choose/switch engines every single query that you run. No search engine company is ever going to provide this functionality to me, despite the fact that this functionality would really help me in organizing the world’s information. This is something that has to come from the browser. It has to sit at the user-level, rather than at the back-end, corporate level. It has to be statistics that the user can gather, about him/her self. Did Moz 1.0 have this? Will Firefox ever? So, another thing Firefox could do, when keeping track of all the queries that you are running on Google, is make note of *how many* queries you actually end up doing, on Google, before you finally find the link that you are looking for. And I am failing to find what I need, after each query. Finally, after the last one, I find it. Let’s suppose it’s the 2nd result on the 4th query. Well, because the browser had been doing these speculative “what if” queries on the other search engines, it now knows that, had I used, say, Ask, that link that ended up being relevant to my query was actually the 5th link on the 2nd query, above. Again, had that 2nd query been executed on Ask, rather than on Google. Or the browser might also know that, after the 1st query, a Yahoo query term suggestion appeared for “results fusion”. And had I used Yahoo, I would have found the keywords that eventually led me to finding the correct page. But I would have found those keywords *sooner*! So the browser could keep track not only of the relative ranks of the information I am seeking, across various platforms. It could also keep track of how long it “would” have taken me, on other platforms. And if it takes me 4 query iterations on Google, and only 2 on Yahoo, then that information should be made available to me, the user. This is what I mean by a “Google Analytics”, but for the user. Give me this sort of information, about the opportunity costs of not using other search engines, and this whole issue of Google buying its way into the default position of Firefox will become a mute point. When you give users the power and information to make accurate, side by side comparisons in this matter, there will not be fear of lock-in. There won’t be fear, because the users will either see that their default really is the best (and therefore choice and not branding or laziness to stay with the current engine), or they will see another option that works better for them (informed choice, knowing exactly why the user is leaving). We can’t do this in the physical world. When traveling to New York, we can’t take BOTH United and American, at the same time, and see how that flight, on that day, would have gone. One person only has a single body. But with technology, we can do this. We can use the browser to speculatively execute queries on multiple engines and then keep track of the results, and present users with those results. Somebody, please innovate in search. All I see all day are more email interfaces, more chat clients, more blah. OMG I’m amazed anyone actually cares about this — I mean both M$ and Goo are really flakey…. That engine was really good at finding stuff Google couldn’t (and still doesn’t). I’m amazed how many novices are who think that Google is actually useful for finding anything other than stuff that you already know about (like ebay or amazon). It may be better than M$ search, but if you ask me that’s kind of like saying that you can jump higher than a person sitting in a wheelchair. It’s really shocking to think that anyone would get excited about this. John, do you have reader stats about how many people under 25 read this blog? Because even if they don’t have alot of money, IMHO they *do* have alot more “hands on” experience of using the Internet than many “old media people” do…. JG, you are not alone to feel that search needs more innovation. Search is as important to web as education to the human world. Just like people want to evaluate a school by its actual statistics, it is understandable that people benefit by evaluating a search engine by its actual statistics. So in a broader sense I share your passion. One problem with your suggested implementation is that for many search instances, people may not be looking for a specific website. Suppose for a query two websites X and Y would have satisfied you. One search engine gives X and another Y, then the search engine in the background is at a disadvantage. The statistics component would falsely assume that X was the only right answer, and the background search engine missed it and gave Y. Another problem is the influence on the query due to query suggestion feature and their placement. These features may determine how a search session goes. I do agree with your basic premise that internet browsers need to have more support to help choose the search engines. In fact, for me personally, one search engine does not fit all my needs — not Google, not Yahoo, and not even my own employer’s (Microsoft) search engine. Often I know from my query type which search engine I want to try first. For an example, if I have an academic query I might try Google first. For commercial intent queries, I might try Live search first. If I precisely know what I want to buy, I might try Amazon first, but going forward I might try cashback.com to pocket some free money. So an internet browser can dynamically determine my query type and send that query to my chosen search engine for that type. I do not want to take my Math classes from a History professor. I want a Math professor if the education type I want to learn is Math. Having this automated functionality for a browser to choose my favorite search engine for a vertical helps budding entrepreneur to bring more innovations to the market. Developing a good general purpose search engine from scratch may be hard or even impossible for a start-up. But a start-up may be able to beat a general purpose search engine in a specific vertical. The startup could succeed with increased probability, if people have an easy way to use its search engine for the vertical. (The commentator is a researcher in Microsoft). One problem with your suggested implementation is that for many search instances, people may not be looking for a specific website. Kamal, yes.. absolutely. In fact on many other comment threads on this blog I talk about this fact almost incessantly. Going back to Andrei Broder’s 2002 taxonomy, there there are not only “navigational” queries (i.e. people looking for a specific website), but there are also transactional and informational queries as well. And I usually mention it in the context of how Google really only supports navigational queries, to the detriment of informational.. even though Broder shows that up to half of all queries on the web are informational. So yes, I absolutely agree. I just wanted to use that as an example of a type of thing that Firefox could do, to innovate, and to help the user. Rather that to help only Google. And I chose that example because most people on the web seem to only be aware of navigational-type searches. At the risk of offending readership here, I don’t think more than 30% of the readers of this blog have really thought about what it means to have an informational search. So since most people really only understand navigational searches, anyway, that might as well be the first type of functionality that Firefox implements. Yes, I agree as well. What you are essentially saying is that we need better metrics for evaluating interactive search / search as a dialogue. We absolutely do. Nobody has those yet. Not industry, not academia. All we have are NDGC and MAP, which break down in this type of scenario. Still, it couldn’t hurt to let the user know that a query term that they ended up using, six frustrated steps into their search process on engine A, had actually appeared much, much earlier as a query term suggestion in a speculatively “what if” query on search engine B. That statistic, I agree, does not capture the full impact of the potential interaction. But it at least makes the user aware of possible benefits occurring elsewhere. In fact, for me personally, one search engine does not fit all my needs — not Google, not Yahoo, and not even my own employer’s (Microsoft) search engine. I feel the same way. I definitely use different search engines, all the time. I have 5 different engines in my toolkit, and use different ones for different reasons. However, most people are not like us. Most people pick one thing and stick with it. Which is to me the height of irresponsibility. Because I agree with you that search is as important as education. And someone who is unwilling to use more than one engine, who is unwilling to go through the mental effort of figuring out when and where various searches works better or worse, using the different search engines as a tool for their problem of the moment, is like someone who will only listen to/believe/accept one point of view, ever, and is not open to the possibility of changing their mind. Any good scientist realizes that he or she should always be open to new evidence. So what do you think, conceptually, about Google’s Universal Search? It seems to me that when you ask a Math question, Universal Search attempts to answer your Math question with a History, Art, Literature, Math, Physical Education, and Physics answer. It doesn’t attempt to figure out that your question is a Math question, and then give you Math answers. It seems to go out of its way to try and include Physical Education answers, too. I’ve personally never quite understood the motivation behind Universal Search, for that very reason. On the other hand, I agree with you again that the browser itself should help you discover, among the various search options on the web, which option is the Math option, when you ask a Math query. When was the last time Google ever returned a link to Flickr image search, as a search result? Google doesn’t do that. So Firefox should. You guys are overlooking add-on for Firefox Growe Toolbar 1.6.4. even after you are given the link ! I understood the upper right searchbar was customisible : the Growe tool has its own load and I expect it is too ( couldn’t be bothered to check ). I’ve been more excited by Google options when I log in to my account and by tools like del.ico.us which allow bookmarking over different computers and file sharing. Tag indexing is available in different configurations for changed methods : cloud is nice. Furl is another place I find new sites by checking RSS notes loaded into iGoogle. Ditto Pageflakes. Mashups and social media are a whole new world of information transfer : StumbleUpon and Clipmarks only two of a raft of options. Come by and check my tools and educational information if you need an eyeful : under “links” rather than on the main page. Please excuse the blogwhoring people. I do it for everyone else too. JG, IMHO, universal search is a good idea. When a search engine does not know the real intent behind the query, it is good to hedge the bet and show diversified results. As the search engine gets to know the users and estimates of the real intent get better, then the search engine can change the mix in the universal search. What do I think about Google’s universal search does not have a short answer. In general, being so far ahead of its competitors, when Google implements new ideas in search it errs on the side of making money, e.g., owning the second click. Should be interesting to see what Microsoft does to the next IE, I can not say that I blame them for making Live the default search if they do go that route. When a search engine does not know the real intent behind the query, it is good to hedge the bet and show diversified results. So couldn’t we make the same argument to Firefox? That search box in the upper right corner should not be a “Google” box. But neither should it be a “Yahoo” box or a “Live” box or an “Ask” box or anything. It should be a “Firefox” box. There should be a preferences menu to let the user choose which of the underlying search engines Firefox should include in its search (i.e. a user in the U.S. might want to include G,Y,M,A, but not Baidu.. whereas a user in China would). And then, as people use the Firefox search box, what Firefox should be doing is something similar to what Asa and I have been talking about… farming out the search to multiple engines, keeping track of where which documents appeared in the lists of the various engines, and *maybe* even mixing up the results of the various engines to show the most diversity. As the search engine gets to know the users and estimates of the real intent get better, then the search engine can change the mix in the universal search. And then, as the Firefox search interface gets to know the user, and which underlying mixture of search engines do the best job at meeting that user’s real intent (satisfying the user’s information need), then the Firefox interface can change the mix of the underlying engines. That way, the user gets both the most relevant results AND gets to discover/explore/experiment with multiple search engines simultaneously. The Firefox search should also not hide this mixture from the user. The user should be able to know which engines are currently being favored by the Firefox mixture — and by “favored by Firefox” I do not mean “chosen by the people who are donating money to Firefox”. I mean “personalized to the user him/herself, based on their own searches and clicks”. This Firefox search box should also be completely transparent, as to *why* certain mixtures are used, and not others. The mixture formulas, the statistics about the relative ranks across various engines, the averages and stddevs, etc. All of that should be exposed, transparent, open source. If this is really about the user, really about the ultimate end goal of relevance, Firefox should be doing something like this. Asa never responded, but I don’t think Mozilla 1.0 did this. And I will check out opit’s Growe Toolbar suggestion, but again, I don’t think it does this, either. And yet I cannot think of a tool that would be more useful to me, the searcher, than a tool like this. Not chat, not horoscopes, not finance, not rich gui email. Give me a tool that really lets me control and understand my online experience, gives me a mixture, a diversity of information sources, and then personalizes it to the type of searching that I, myself, most often do. Which could be very different from the type of searching that you do. One thing I’ve noticed, for example, is that both Yahoo and Google have very relevant results in the top 3. But the results themselves are different! Google finds one very good answer, and Yahoo finds a different, but equally good answer. Anyway, I apologize for the length of my responses…every once in a while I get into this mode. I hope I haven’t come across as too trollish; I am just passionate about this particular topic. JG, Profusion was IMHO a very good meta-engine (see my remark above), and I think I remember some remark on Vivisimo’s ( http://clusty.com ) FAQ page saying that Google did not *permit* them to do meta-search — so perhaps that’s not Firefox’s fault but rather Google’s. I think this problem could easily be solved by people simply boycotting search engines that do not allow their results to be used in meta-search engines — I think that would be an easy way of establishing a level playing field. But in many cases it is already much more effective to use targeted / vertical search properties (e.g. for downloads, download.com is a premiere search engine) — and that will probably also be increasingly true in the future (I think it won’t be long before we see the first engine to search for “Manhattan”, “swimming pool” across hotels.com, hotels.net, hotels.org, hotels.info, hotels.biz, hotels.mobi [and perhaps also various “jurisdictions” such as hotels.us, hotels.co.uk, hotels.de, etc.])…. nmw: My favorite metasearch engine of all time was SavvySearch. Circa 1996. It had as much, if not more, of that “wow” factor that Google did, only years earlier than Google. Seriously, the first time I ever used SavvySearch, I was blown away by the huge difference in quality, how much better it was than anything else I’d used up to that point (including Altavista, Infoseek, etc.) I’ve always wondered why it never caught on. It was amazing. So since that point (1996) I’ve been a huge believer in metasearch. However, let’s read these terms of service very carefully. It says “no metasearch” in the context of “personal use only”. But what I am proposing would indeed be personal use only! I would not be reformatting Google results and sending them to other people. I would not be creating a new, public search engine based on Google’s results. I would only be using them, myself, directly. So under this terms of service, Firefox should be able to create the tool, that lets me do exactly what I want to. Because it’s not Firefox that is doing the search. It is *I* that am doing the search! Later in this same terms of service, Google also says “no automated querying”. Well, what does that mean, exactly? My understanding is that automated querying is when you have thousands of keywords, and you send ’em all of to Google, in a large batch, to see how Google performs. That’s not what I, using the Firefox tool, would be doing. I would be executing only real queries, real things that I was searching for. There would be no “batch” about it, at all. Only one query at a time, and only driven by my own information need. I mean, if what I am proposing above falls under the definition of “automated query”, then Firefox’s current interface also falls under automated query. Because when I type my query into the upper right search box, Firefox “automatically” reformats that query, calls the proper APIs, and “automatically” queries Google. The current Firefox tool does not query Google manually. It queries Google “automatically”. So if doing that is already within Google’s terms of service, I am not adding anything to that, from Google’s perspective. Firefox is still only making ONE SINGLE query call, for my personal use only, to Google. It’s just that Firefox is also making that exact same ONE SINGLE call to Yahoo, also. And to Baidu. And to Yandex. But it is only a SINGLE call to Google.. nothing more than is already happening, through Firefox, right now! Well, since my purpose in querying Google, through the Firefox search bar, is not to determine how a website ranks, but to get an answer to my query, I think I fall well within the terms of service. Indeed, I don’t even know what webpage I’m looking for.. that’s the whole purpose of the query to begin with. So I would definitely not be against Google’s terms of service, here. And, after my personal, non-automated query is executed, if Firefox simply stores where the various SERP pages were ranked, and then helps me correlate the ranks across various search engines, then so be it. That wasn’t the original purpose of my query. It’s a byproduct. And if this byproduct is against Google’s terms of service, if Google won’t let me store information about the genuine, personal searches that I myself am doing, then that implies all other byproducts are against Google’s terms of service. What’s next, will Google demand that I stop bookmarking (storing in Firefox) any web page that I find via the results of a Google search? Because really, that’s all that is happening here. The Firefox tool is just letting me bookmark all of the results from every search that I’ve ever done, on any engine. For my own personal use. So, IANAL, but it seems to me that most if not all of what I propose should be doable. So when is Firefox gonna get to it? JG, you are *totally correct*! If Firefox truly cares about its user base, then it would do this at the drop of a hat: it would be a *HUGE* service to add value to its product. On the other hand, I could also see this becoming a feature that IE could incorporate into its own browser, and thereby create a feature that the tech-savvy community would cherish. I have already suggested that search engines should abandon Google’s hare-brained idea concerning “no-follow” links (or perhaps to expand the user’s ability to configure the search engine’s settings [which might, however, complicate the management of the index, such that only the computational “big players” could stay in the game]). Indeed I would also say that a search engine could discount links that are older then a year (and maybe even let the user “adjust” this setting to limit the search focus to perhaps 1 month, 1 week or 1 day). Indeed: I use such a search engine now and I am very happy with the results. But to get back to your point: I think Firefox would “get it” rather quickly if/when Microsoft implemented such a meta-search bar into the next release of their IE. I could also imagine that browser designers would perhaps do quite well to expand their “usability” features for direct navigation. For example, if I typed “cars” into the navigation bar (or the search bar? or the “domain” bar?) then the browser could present me a list of domains with that keyword (starting with exact matches — e.g. “cars.com”, “cars.net”, “cars.org”, “cars.info”, etc.) — perhaps with screenshots and/or additional info (this would perhaps also have the added feature of giving the term “browser” the significance of actually being a useful tool for browsing). I like firefox generally, but its bias to Google has always been very frustrating. There are ways to get the best out of Firefox, however, detailed in the book Hacking Firefox: More Than 150 Hacks, Mods, and Customizations by Mel Reyes. You can find it in ebook form at BooksOnBoard.com This book teaches you how to get tighter security and greater functionality, a custom installation for Linux, and unique extensions that you can create. From hacking profile settings to cracking links and cleaning out the cookie jar, this book teaches you how to tweak firefox to your liking, including Step-by-step instructions for these hacks and dozens more: Settings, content, and extension hacks, Hacking the interface and themes, Performance boosters, Anti-phishing and security hacks, Toolbar and status bar tweaks, Navigation, download, and search hacks Hacks for common plugins, as well as Extension and theme creation. It’s a great book. I like firefox much better than Explorer, but everything has drawbacks. There are ways to get the best out of Firefox, detailed in the book Hacking Firefox: More Than 150 Hacks, Mods, and Customizations by Mel Reyes. You can find it in ebook form at BooksOnBoard.com This book teaches you how to get tighter security and greater functionality, a custom installation for Linux, and even how to create that unique extension you’ve always dreamed of creating. From hacking profile settings to cracking links and cleaning out the cookie jar, this book teaches you how to tweak firefox to your liking, including step-by-step instructions for these hacks and dozens more: Settings, content, and extension hacks, Hacking the interface and themes, Performance boosters, Anti-phishing and security hacks, Toolbar and status bar tweaks, Navigation, download, and search hacks Hacks for common plugins, as well as Extension and theme creation. It’s a great book. nmw: It sounds like what you are calling for is a search engine that gives a user more control over their own experience. I wholeheartedly agree as well.